that responds to your needs. * Complete documentation is required. 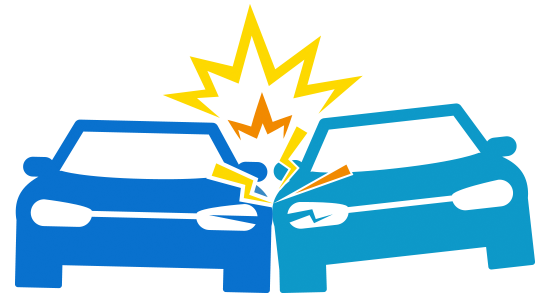 Triple-S is one of the leading insurance companies in Puerto Rico, offering products for all your needs: Health, Life, and Property. We have 7 Service Centers, even in Plaza Las Américas and Plaza Carolina, open on Saturdays and Sundays. The check is available within an hour if all the documentation is submitted. If you have an auto claim, Triple-S Propiedad's pre-qualified workshops are your best option for repairs. You will receive a professional and trustworthy service, with the VIP treatment you deserve. Report and check the status of your claims, set up appointments and so much more through our mobile app. What is the Compulsory Liability Insurance policy from Triple-S Propiedad? Triple-S Compulsory Liability Insurance provides liability coverage for damages to third-party property, as required by Law #253. 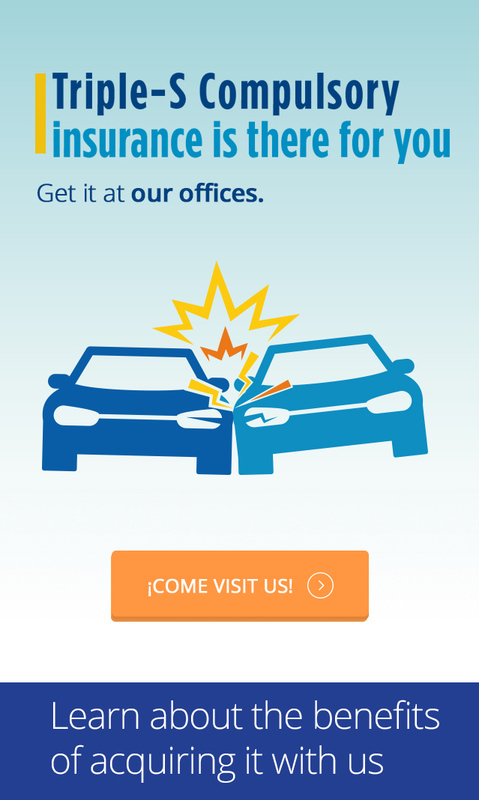 This policy covers accidents that happen in Puerto Rico and are caused by the insured vehicle. This policy’s validity period is always the same 1-year period as the vehicle’s license, and it comes into effect when the corresponding premium has been paid in full. $100 incentive for the owner of the damaged car if they show evidence of the paid damages. A reimbursement of the Sales and Use Tax (IVU, by its Spanish acronym) is applicable to incurred parts and labor costs. Reimbursement of towing expenses for cars that cannot move due to the accident, subject to the established rates and limits. Reporting your claim is easy! Notify the police of the accident within 48 hours. From July 1st, 2015 onward you will be able to choose your own Compulsory Insurance by writing an “X” on the Selection Form. Law #253 establishes that every motor vehicle transiting through Puerto Rico’s public roads must own liability insurance. The same law establishes that every motor vehicle owner may freely choose their insurance company for compulsory insurance. 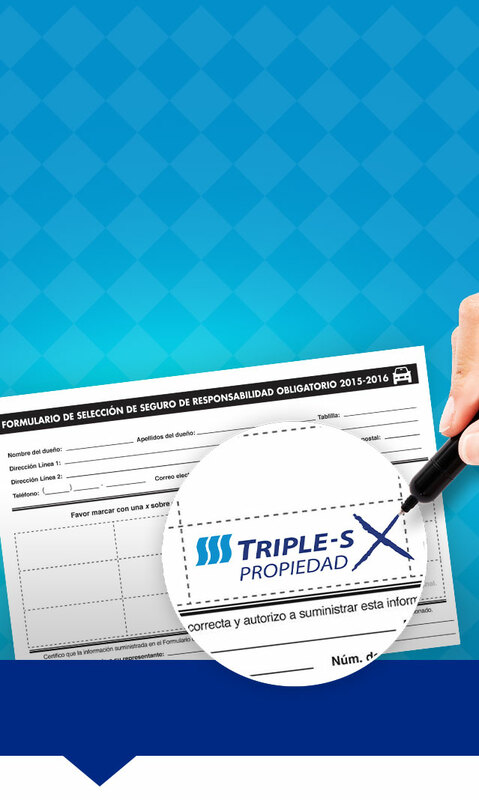 When buying your tag, choose Triple-S Propiedad in the Selection Form. How can I acquire Compulsory Insurance? To acquire Compulsory Insurance with Triple-S Propiedad, you may visit any of our offices around the Island. Plus, when the time comes to renew your tag, you have the option of visiting your bank, cooperative, or closest inspection center. When they hand you the Selection Form, mark an “X” under the Triple-S Propiedad logo. What is Compulsory Liability Insurance? It refers to the insurance required by Law 253-1995, as amended, that answers for damages caused to third-party motor vehicles as a result of a traffic accident for which the owner of the vehicle insured by this policy is legally responsible, and due to its use said damages were caused, in accordance with the system for the initial determination of liability created under said law. What is the Selection Form for Compulsory Liability Insurance? It is the form through which you may choose the insurer that will issue the compulsory liability insurance. You will submit a Selection Form when you are issuing or renewing your license and do not have traditional liability insurance. I have to renew my tag soon; am I required to submit the Selection Form? From July 1st, 2015 onward, and in accordance with Law 245-2014, if you obtain or renew a motor vehicle license and wish to acquire Compulsory Liability Insurance, you will be able to freely select the insurer of your choice. Select the insurer of your choice from the Selection Form, except when you have acquired traditional liability insurance that is the same or greater than the Compulsory Liability Insurance. What is Traditional Liability Insurance? It is insurance, which unlike Compulsory Liability Insurance, covers any loss, expense, or liability due to the loss or damages caused to persons or property, resulting in the possession, conservation, or use of said vehicle, or related to it, according to the definition considered in Article 4.070 of the Insurance Code of Puerto Rico. I already have Traditional Car Insurance. Do I need to get Compulsory Insurance? No, you only need to request a Compliance Certificate from your traditional insurance provider. It is the certification issued as proof of your compliance with the Compulsory Liability Insurance requirement. The certificate is evidence that you currently have liability insurance, which provides coverage of equal or greater value than the Compulsory Liability Insurance, at the time your motor vehicle license was issued or renewed. This Compliance Certificate voucher has the effect of exempting said vehicle from paying the Compulsory Liability Insurance, which is the corresponding fee when paying for the license rights of the motor vehicle. I want to change the insurer I selected in the Selection Form. Is that possible? During the policy’s term of validity you may only change insurers if the motor vehicle is guaranteed to continue being insured by a traditional liability insurance that is similar or greater than the Compulsory Liability Insurance. Can I cancel the Compulsory Liability Insurance? The Compulsory Liability Insurance will be valid as long as the motor vehicle license is issued, unless you may prove the disappearance of said vehicle (be it through a junk certificate or an exportation certificate), or through the purchase of traditional liability insurance. Is there a penalty for having a vehicle which is uninsured by either a Compulsory Liability Insurance or Traditional Liability Insurance? Keeping an uninsured vehicle is considered a misdemeanor crime, which carries a $500.00 fine and the seizing of the vehicle’s license plate, by public officials. Likewise, the owner of the uninsured vehicle won't have the right to recuperate the damages suffered during a traffic accident, exempting the owner of the guilty party from the responsibility of paying an amount equal to the coverage limit provided by Compulsory Liability Insurance.